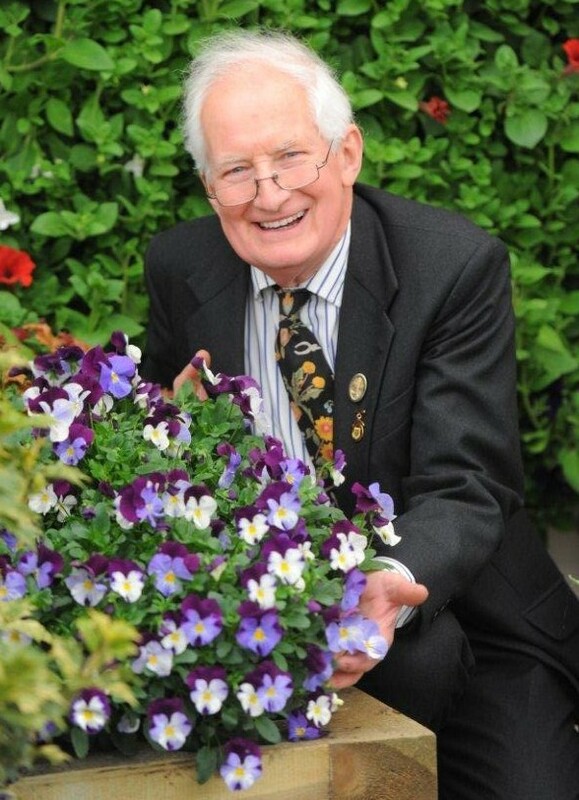 Peter Seabrook MBE., VMH., AH(RHS), M.oH. (RHS) started working at weekends on a local market garden before starting secondary school. He grew sweet peas in his back garden to sell to the local florist and raised enough money to fly to Holland and visit nurseries there aged sixteen. Peter was employed on seed trial grounds for two years before studying horticulture at Writtle College gaining the College Diploma in 1956. During college vacations experience was gained working in top fruit orchards, bedding plant and tomato nurseries, before doing two year national service were the army paid for lessons in floristry! Returning to Cramphorn the seed and garden retail company, he worked in all areas of nursery production, mail order and shows becoming nursery director. Then after four years on the road for Bord na Mona, travelling in the South East of England and the Channel Isles as their technical representative, he became a consultant to leading wholesale nursery companies, a director of two separate garden centre companies and gave advice to many independent horticultural businesses. His broadcasting appearances started with the BBC Radio Home Service in 1965 including In Your Garden and Gardeners' Question Time, then on to BBC Television from 1975 presenting such programmes as Gardeners' World, Pebble Mill at One, Chelsea Flower Show and in America over twenty years broadcasting coast to coast with PBS programme The Victory Garden out of Boston, USA. Two of his books Complete Vegetable Gardener and Shrubs for Your Garden, the latter set to music and premiered in Sydney Opera House, have been published in more than ten languages. Steve Bradley M.A M.Hort(RHS) Steve grew up on a mainly rose nursery in Lincoln before moving on to work at a larger nursery/garden centre as he gained qualifications. He studied at Pershore, Cannington and Writtle Colleges as he progressed to the prestigious RHS National Diploma in Horticulture (now known as Master of Horticulture). He then spent over 20 years teaching Horticulture at every level from amateur to degree at colleges around England, specialising in Propagation and Nursery Stock (the production of young hardy plants). Since leaving his last college in 1996 to go freelance, he has also taught on subjects as varied as soils, pruning, turf-care, vegetable growing and the control of pests and diseases both privately and at colleges. 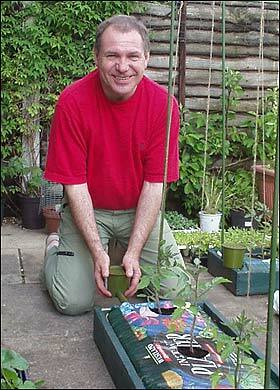 Steve appeared in two television series in the early 1990s; Plant Life and Garden Doctors, and in a series of how-to videos on topics including Propagation, Clematis and Roses. He has written (or co-written) around 45 books on various gardening topics. Along with wife Val he wrote the support material for the Ground Force TV series. His most recent work is a revision of the Grafter's Handbook, a book that was constantly at his side as both a student and a lecturer. He writes articles for several magazines and answers live phone-in questions almost every weekend throughout the year on BBC local radio in Kent, Surrey/Sussex and Essex. Thanks to the internet, these can be heard anywhere. He and Val have worked for the Sun newspaper since 2002, writing the Gardening page with Peter Seabrook and answering hundreds of readers' letters every year. Her pre-college year was spent in a local authority parks department, working on the nursery, on the floral display team and in the botanic garden before going on to complete an OND course in Amenity Horticulture at Askham Bryan College, York. This involved a working middle year, which was spent at a nursery producing hardy plants, houseplants and potted bulbs for DIY stores and large shops. After moving to Essex when Steve changed jobs, Val worked for Cramphorn's at their flagship garden centre on the outdoor plants area - and, ironically, met Peter Seabrook, although only in passing. This was followed by working at Wisley Gardens and on both hardy plant and bedding plant nurseries, to fit in around two young sons. Val has taught gardening at night school, answered live phone-in questions on local BBC radio, written for various magazines and written (or co-written) 12 books. She also acts as editor for Steve. She and Steve have worked for the Sun newspaper since 2002, writing the Gardening page with Peter Seabrook and answering hundreds of readers' letters every year.